beerbistro has announced that they will be hosting a pairing dinner and tap takeover event to celebrate the Ontario debut of draught beer from Oregon’s Rogue Brewing. Taking place on Wednesday September 19th as part of Toronto Beer Week, the dinner will be hosted by Stephen Beaumont, and will feature 10 courses with beer pairings. Tickets for this exclusive event are $125 plus tax and gratuity, and will be going on sale on Tuesday September 4th at 10 AM. Call beerbistro at (416) 861-9872 to reserve by credit card. In recognition of the recent formation of the Ontario Hop Grower’s Association, a non-profit association of 28 organic and conventional growers in the province, the Ontario Ministry of Agriculture, Food and Rural Affairs has announced plans for the 1st annual Great Ontario-Hopped Craft Beer Competition(GOHCBC). Open to commercial brewers and students in their graduating year of accredited Ontario Brewmaster courses, the competition will challenge brewers to create beers using exclusively Ontario-grown hops. The beer style chosen for this inaugural edition of the competition is American IPA, with entries to be judged based on the Beer Judge Certification Program (BJCP) guidelines for the style. Interested participants must register for the competition by December 31st, 2012, and samples must be delivered or dropped off by February 20th, 2013. Judging will take place on February 21st during the Ontario Fruit and Vegetable Convention at the Scotiabank Convention Centre in Niagara Falls, Ontario. Full competition rules and other details are available on the GOHCBC website. The next installment in the Canadian Beer News Dinner Series is set for this Friday, April 27th at 6:30 PM, and it promises to be a fantastic night of amazing food and beer. 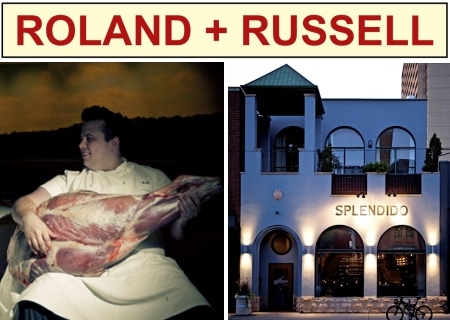 The dinner will feature a selection of outstanding international beers from importers Roland + Russell paired with the stunning Canadian cuisine of Victor Barry, co-owner and Chef de Cuisine of Splendido (88 Harbord Street, Toronto), one of Canada’s most celebrated and acclaimed restaurants. Amongst the eight beers being poured to match the canapé reception and six courses will be several rare and exclusive offerings, including the Ontario debut of Hitachino Nest XH, a Belgian-style ale from Japan that has been aged for three months in sake barrels; and an exclusive appearance by De Struise Double Black, a monstrous imperial stout from Belgium that is so rare only a single case was shipped to Canada. Only 24 seats are available for this landmark event, so those interested in attending are encouraged to act quickly to avoid disappointment. Tickets are $150 per person (plus taxes and 18% pre-tax gratuity), and can be reserved by calling Splendido at 416.929.7788. The full menu and other details are available after the jump. Canadian Beer News is pleased to present the second event in the Canadian Beer News Dinner Series, an ongoing series of dinners that bring together some of Canada’s top breweries and beer importers with outstanding chefs and restaurants to create unique and exciting beer and food pairing experiences. 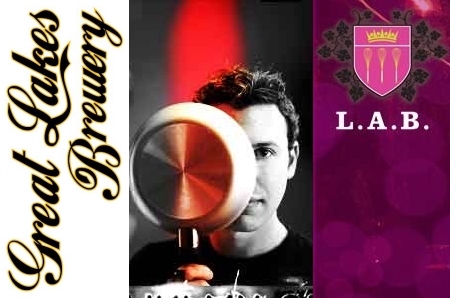 For this event we’ll be celebrating the art of experimentation, as the adventurous beers of Great Lakes Brewery – including several special one-off brews – will be paired with the unique ‘cucina moleculare’ crafted by chef Howard Dubrovsky in the kitchen of his L.A.B. Restaurant. Only 20 seats will be available for this dinner, so those interested in attending are encouraged to act fast! Founded in 1987 and independently owned by the Bulut family, Great Lakes Brewery is Toronto’s oldest craft brewery. After almost 20 years of producing exclusively lagers, the brewery launched Devil’s Pale Ale in 2006, and has since added a number of seasonal beers to its portfolio – including Green Tea Ale, Orange Peel Ale, Pumpkin Ale and Winter Ale – as well as a constantly growing list of limited edition and one-off beers, many of them served at the “Project X” open house events held each month at the brewery. Known for his appearances on CBC’s Gill Deacon Show and other media, chef Howard Dubrovsky opened his restaurant L.A.B. (Live And Breathe) in Toronto’s Little Italy in 2010, and has gained rave reviews for his experimentation with what he describes as ‘cucina moleculare’: a new style of cooking where classic Italian fare is recreated with a modern, yet familiar style of molecular gastronomy. Canadian Beer News is a website and news blog dedicated exclusively to coverage of Canada’s beer and brewing industry. Presenting news and information with minimal editorializing, CBN features announcements of new beer releases, brewery openings and closures, news about festivals and events, and other information from breweries all across the country. While Ontario beer drinkers are in the midst of the 2nd annual Ontario Craft Beer Week, our friends in a nearby American city that’s quite popular for over-the-border beer runs are also celebrating our favourite beverage with their own week of events. 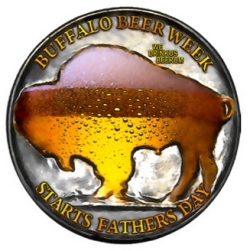 Buffalo Beer Week is running on the same dates as OCB Week – June 19th to 26th, 2011 – and it features a great line-up of dinners, tastings and other happenings at such popular Buffalo beer destinations as Cole’s, The Blue Monk, Mr. Goodbar, Pizza Plant and many more. A full schedule of events can be found on the BB Week website. And here’s hoping our respective weeks will fall on different dates next year so we can head down there to join in the fun, and vice versa. This always fun event will feature beer, BBQing, live music and a kids fun zone with games and prizes. This year’s proceeds will be going to the Franklin Horner Community Centre, which provides a meeting space in the Alderwood and South Etobicoke area for community groups as well as a range of programs to families with children under six, youth, seniors/older adults and newcomer groups. A drop-in style social with a number of Amsterdam beers on tap and cask, including one-off collaboration brew Pink Ribbon Mild (proceeds to The Canadian Breast Cancer Foundation) as well as Boneshaker IPA, Boneshaker IPA Double Dry-Hopped, Tempest Imperial Stout and Oak-Aged CJM Brown Royale. No cover, just pay for what you drink. Launch of a new event series being presented by the Bar Towel on Sunday afternoons throughout the summer. At each event, a different Ontario brewery will be on hand pouring a few of their beers, and pizza freshly baked in the outdoor oven will also be available. The first event will feature Flying Monkeys Brewery. Partial proceeds to The Stop Community Food Centre, co-presenter of the Brewery Market. Launch event for Muskoka Brewery‘s new Mad Tom IPA, in conjunction with Marben’s monthly pig roast on the patio. $25 per person, reservations recommended. All in all, this weekend looks like a great kick-off for what will hopefully be a summer filled with great beer events in Toronto. So get out there and enjoy! Due to popular demand, Grand River Brewing has added an extra date to their 2010-11 Beer Club series of tasting sessions at the brewery. The additional session on Tuesday April 12, 2011 is a ‘Brewers Passion’ cask night featuring 5 pins from 5 brewers with no pre-determined styles or rules. The $15.00 admission includes a sample of each pin and munchies, and it’s pay-as-you-go after that. Please call 519-620-3233, email jsouthgate@grandriverbrewing.com or drop into the brewery store to reserve a spot. Following on the heels of their purchase of Heritage Brewing last month, Kichesippi Beer Co. owners Paul and Kelly Meek have purchased the trademarks and brands of Scotch-Irish Brewing as well. Scotch-Irish was originally founded by brewmaster Perry Mason, who brewed his beers under contract at Heritage Brewing for several years before selling the brands to Heritage owners Ron Moir and Donna Warner and brewmaster Ancil Hartman. Under the original terms of Kichesippi’s takeover of Heritage, the trio were going to retain ownership of Scotch-Irish and continue having the beers brewed at the rebranded Kichesippi Brewery. But with this more recent deal, all three labels are now under the Meek’s ownership. Writer and local food advocate Signe Langford has announced the launch of The Malt Exchange, a new initiative she is spearheading to help craft breweries in Ontario connect with local farmers and supply them with spent grain from brewing to use as animal feed. The first partnership initiated by the program will see Toronto’s Granite Brewery supplying around 600 kg of spent barley malt per week to Kawartha Ecological Growers (KEG), who will be feeding it to the various animals they raise including cows, pigs, lambs and chickens. As a way of bringing the project full circle, Ron Keefe of the Granite and Mark Trealout of KEG have also discussed the possibility of serving meat from the animals that are fed the grain in the Granite’s tied house pub. Brewers and farmers who are interested in participating or finding out more about the Malt Exchange can contact Signe via the project website.